Due to varying models and option levels, not all parts listed in the chart below apply to all vehicles. 1. 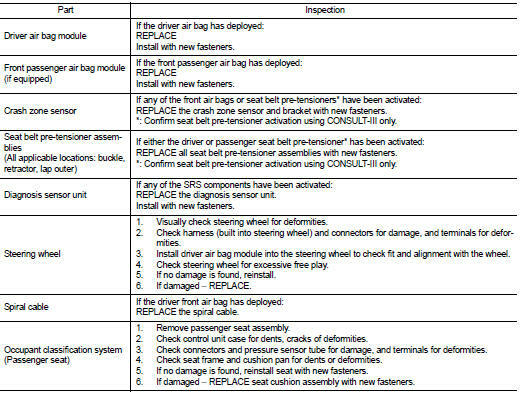 Before performing any of the following steps, ensure that all vehicle body and structural repairs have been completed. 2. Replace the diagnosis sensor unit. 3. Remove the front air bag modules, crash zone sensor, bracket and seat belt pre-tensioner assemblies. 5. Install new front air bag modules, crash zone sensor assembly, bracket and seat belt pre-tensioner assemblies. 6. Perform self-diagnosis using CONSULT-III or air bag warning lamp. Refer to SRC-12, "Description" for details. Ensure entire SRS operates properly. 7. After the work is completed, perform self-diagnosis to check that no malfunction is detected. Refer to SRC-12, "Description".